As more of these media walls begin to present themselves as display interfaces, it appears form and function have inspired a very interesting marriage between architects and digital media system integrators. Ding. Now the wall has become a giant iPad screen pouring out text, video and graphics with endless streams of information about a brand, product or exhibit display. Meet the interactive media wall, a new display format in public space communication, mostly found in corporate lobbies, museums or transit terminal corridors. As more of these media walls begin to present themselves as display interfaces, it appears form and function have inspired a very interesting marriage between architects and digital media system integrators. The object of their desire: exploring the wall as the architectural space to conquer, a convergence that is often referred to as 'mediatechture' where media displays have become integrated into the building. The media wall is a large collection of LCD screens tiled together in a landscape form (average length is four-feet by sixteen-feet), and fitted out in a lobby or specialized public space area. Once activated, the media wall displays a series of photographs, graphics and video files in regard to whatever subject it represents. The sweet spot of this visual presentation is all image files are activated via multi-touch with your hands touching, moving and activating the various media files as desired. These media walls are the new poster child of interactive displays with no shortage of people appearing to activate them. Interactive media walls have been appearing lately as very proactive branding platforms for corporations within their corporate lobbies, sport stadiums or themed public areas as a way for them to fully engage passersby with their specific corporate messages. One company involved with developing media walls is Arsenal Media (Montreal, Canada) who views themselves as a creative agency that produces the strategic development as well as the client's branding content for these unique media wall experiences. "As a digital display, interactive media walls are definitely a form of signage," says President Denys Lavigne, "but a special kind that is interactive and provides multiple layers of brand and advertising messages at an audience who engages with the media wall on an almost personal level." "To differentiate these media wall displays," said Lavigne, "We view them as interactive destinations, with the screen as a media hub using any combination of interactive devices including gesture-based recognition, multi-touch, augmented reality, or even smart phones (when appropriate users can send text messages to screen), as a way for the public to interact with the client that sponsors the media wall." The development of these interactive media walls usually involves several disparate companies including supplying and installing hardware (display screen, media servers, gesture recognition cameras) and content creation and interactive software applications (multi-touch program, client development). Managing this process cohesively requires a single company to act as a consultant in coordinating a unified approach for creating the desired interactive media wall. One such company is Sensory Interactive (Towson, MD), a company specializing in integrating digital media into architectural solutions. President Randy Byrd has noted in the creation of these walls, that the most important consideration is "defining the planned uses of the wall to ensure it is engaging and compelling, and that the experience for visitors is relevant and different upon a return visit. Additionally, we must share and establish for the client the expectations of a successful installation. Designing and developing these media walls provides an open canvas that allows the client to present stories about their origins, their brand, and the services they provide to the public." Byrd sees these media walls as a gateway to allow the public to interact with that story. That interconnection allows its users to personalize that corporate story (about the company's technology, products or services) and thus engage with that part of the media wall content. Two recent Sensory Interactive projects included the Wisconsin Institute of Discovery which established an interactive media wall that introduced the institutes involvement with scientific and medical research and the Saint Luke's Hospital of Kansas City's History Wall which told of its origins and involvement in medical and health care for over 100 years of community service (see case histories). As to why interactive media walls are important, a multi-touch, graphic interface gives its users immersive and collaborative ways to engage with photos, videos, documents, maps and custom applications. As for market opportunities, interactive media walls can be utilized anyplace where the public gathers and connects with that business. It transforms the shopping experience by connecting customers with more product options, offering recommendations for purchasing decisions and providing service comparisons, and personalized service. Media walls are usually found in the hotel lobby acting as a digital concierge in providing people with intriguing new ways to get the local tourist information they're looking for-such as maps, dining and club recommendations, background on tourist destinations, etc. Showcases the company's brand and corporate culture with videos, testimonials and a multi-touch connectivity that personalizes the corporation's media message through selective content interactions. 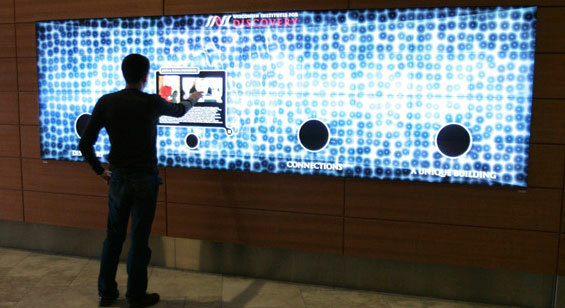 "Because an interactive wall is so large, they are obviously very easy to spot," noted Timo Korpela, General Manager of MultiTouch (Helsinki, Finland) whose company has a U.S. location in Santa Clara, CA, "and they become more of a people magnet in drawing attendance and inspiring people to become involved with the media wall's content." Another benefit Korpela noted, "is with the wall's large display area, it allows (depending on the wall's length) a fair number of people to simultaneously interact with its display area." Media walls as public space Here, multi-touch media walls are presenting a new 'form' of public social media offering more of a consensual social experience. In this context is very public and often may spark conversations between wall users and those waiting to use the wall and begin their own media wall explorations. "Media walls work best when they are seen with people using them because that automatically draws more people to come by and check them out. Seen unused with just images randomly moving about, they are sometimes mistaken for a passive video wall," says Korpela. "As to how a media wall gets used, obviously computer or smart phone literate people are more quickly drawn to them. Older, less computer literate people tend to watch more, and are more 'careful' in their use of the wall." MicroTiles provide a very high resolution image which is easily viewable in sharp detail at a close-up range when people are interacting with multi-touch files at an arm's length from the screen. MicroTiles are architecturally friendly as they are easily embedded within a wall during a project build-out. This gives the media wall an attractive presence as the Micro Tile display now appears almost flush against the physical wall it's embedded in. MicroTiles not only support multi-touch interactivity, but also reacts to gesture recognition, which is a non-touch interactive format. "With all our client's interactive media walls," said Kevin Barlow, senior director of Christie Digital Systems (Ontario, Canada). "The goal is to make the technology blend into the environment so the users don't think about the media wall as a piece of technology, but more as a specialized learning experience." To date, the company has collaborated in more than a dozen interactive media wall projects. "In almost all the interactive media walls we've helped create, children seem to be a natural audience as the kids tune into the wall's functionality almost immediately. They intuitively understand what the media wall offers as a user interface and at once gravitate towards them and quickly figure out the interface in terms of moving pictures and graphics around and getting the videos to play. For our young users, it's not about the wall's technology but more the wall's playful responses and letting the kids choose what they want to learn about." 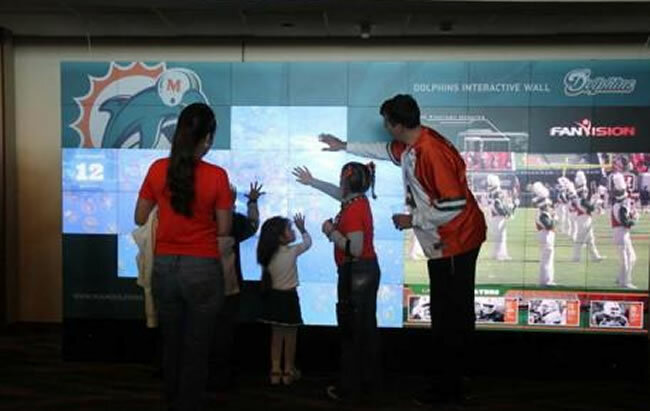 The Buzz Wall, created for the Miami Dolphins at Sun Life Stadium (Miami, FL) was an interactive media wall that presented for fans, an expansive fun "in-stadium" entertainment experience. Once installed and available to Dolphin fans, they were seen gathering around the Buzz Wall, before the game, during the game, during intermission and after the game to have this on-going multimedia contact with the team. For Arsenal, the formulation of these interactive media walls have resulted in the creation of a unique media platform known as The Buzz Wall, with the first client installation at the home of the Miami Dolphins at Sun Life Stadium (Miami, FL) where that interactive media wall was placed to create for fans, an expansive fun "in-stadium" entertainment experience. "The results were outstanding," said Lavigne. "Once installed and available to Dolphin fans, they were seen gathering around the Buzz Wall, before the game, during the game, during intermission and after the game to have this on-going multimedia contact with the team." From all the positive reactions to the media wall, it was obvious there was a buzz going on about the Dolphins new Buzz wall. At the Las Vegas Hard Rock Cafe, the average table waiting time could be anywhere from forty-five minutes to an hour and a half. Now with the Rock Wall loaded with an enormous volume of rock 'n' roll memorabilia and other fun activities, guests have additional entertainment to help them pass the time and make their wait more enjoyable. "The location of the Rock Wall and other interactives within the café was considered carefully," says Rick Sconyers, Hard Rock International's senior director of design, "and was ultimately governed equally by audience traffic flow and the intended purpose of the display." In a typical Hard Rock Cafe on a busy night, Sconyers points out, "Our average table waiting time could be anywhere from forty-five minutes to an hour and a half. Now with the Rock Wall and the Microsoft Surface tabletop display placed within that waiting area, each is loaded with an enormous volume of rock 'n' roll memorabilia and other fun activities. So our guests have additional entertainment to help them pass the time and make their wait more enjoyable." In addition to the flagship Las Vegas Hard Rock Cafe, Rock Walls have been installed in Orlando, Seattle, and Berlin. It has been so popular with guests that Hard Rock is expanding its deployment with a smaller version, a 52-in. display called the Rock Solo that has now been installed in an additional seventy Hard Rock Cafes throughout the U.S. and Europe. Johnson Space Center (Houston, TX) features an edutainment center that provides a multitude of permanent NASA exhibits, attractions, theatres and exhibits. Because of its popularity as a spaceport, it receives around 800,000 visitors a year to its exhibition area. Recently JSC has installed an interactive media multi-touch wall manufactured by MultiTouch (Santa Clara, CA), with content development by FusionPage Interactive (League City, TX). The JSC interactive media wall is located near the entrance to the Space Center Visitor Exhibit area and enables visitors to explore the history of NASA's first flight of the space shuttle. "Although the Space Center has several interactive exhibits," as noted by JSC Exhibit Manager Paul Spanna, "its media wall, because of its large size (4-feet tall x15-feet long) really calls out to visitors who will at least look it over as they pass it by. The media wall's biggest calling point is seeing it in use, which then easily draws other people to it. People tend to associate its interactive process similar to a giant iPhone or iPad, and as they start touching it, they pretty much get immediately how the media wall works. Once in use, it's mostly young people who tend to come to the wall with up to four or five of them crowded around the media wall. When the kids get really enthusiastic about the wall, I've seen as many as eight or nine kids using it simultaneously." The Johnson Space Center's (Houston, TX) media wall's attraction screen displays varying multimedia content, including pictures and data of the space shuttle's first flight, enabling visitors to experience a thrilling, tangible experience of the history of space travel. The Space Center media wall's current program is to introduce the story of NASA's first shuttle flight, STS 1 which launched in April of 1981. To begin, the media wall's attraction screen shows a series of space shuttles floating around in space. By touching the images of the various floating shuttle craft, it opens up window displays containing varying multimedia content, including pictures and data of that first flight, enabling visitors to experience a thrilling, tangible experience of the history of space travel. 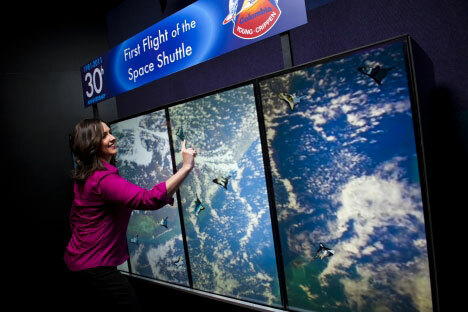 Spanna noted that SCH was pleased with its visitor response to its interactive media wall, and that throughout 2012, the SCH Visitor's Center will expand their media wall's existing content to incorporate a greater NASA narrative discussing other space shuttle missions along the way. Saint Luke's Hospital (Kansas City, KS) was founded in 1882 and over the century has evolved into one of the best American hospitals for cardiac services and stroke care. In the midst of its vast medical experience is an epic story of who they are and how they became an award winning American medical center. In the interest of telling the story of their evolution and legacy, the hospital established an interactive multi-touch media wall known as the History Wall. As described by Caroline Millard, Saint Luke's Foundation marketing director who was part of the hospital team that helped develop the interactive media wall, "it's a very modern and visual way to communicate our history. Plus it's changeable so we can update our hospital history with new accomplishments each year." The media wall's state-of-the-art interactive design of audio visual techniques, were created by Senory Interactive, with display screens by Christie MicroTiles. The History Wall presents a very rich interactive multi media environment of text, graphics, photographs, video, artifacts photographed in 360 degrees that rotate on the screen, hospital news clips, and a 3-D animations. The sweet spot in this multimedia collection is that it is all controlled by multi touch, allowing its users to select whatever images they want to see and view them in their preferred order. "One of the stunning things about the wall is its size," said Millard. "It's comprised of Christie Micro Tiles and measures 4 feet by 16 feet." The wall begins its presentation with an attract screen of dozens of circular "bubble" images. As a visitor moves by the screen, the bubbles move around to follow the visitor. 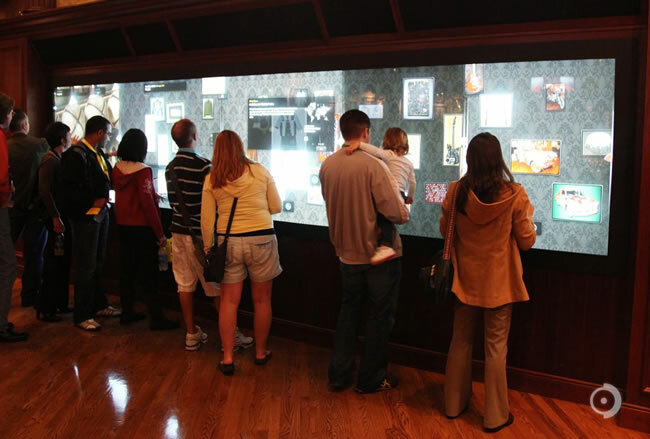 When the visitor moves to the screen and touches it, the bubble images disappear and an interactive vertical timeline emerges. As more users approach the wall, two additional timelines "slide out" from the center allowing three users to explore the wall independently. Conveys Saint Lukes' role as a teaching hospital for medical residents and nursing students. How the hospital started and developed into the world class hospital facility and health system that it is today. 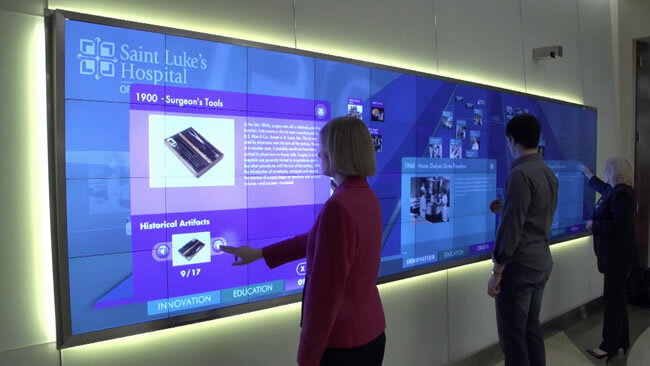 In the interest of telling the story of their evolution and legacy, Saint Luke's Hospital established the History Wall, as an interactive multi-touch media wall which visually presents the hospital's story and history of serving the Kansas City community. As for how visitors react to the History Wall, "The Saint Lukes media wall 'turns heads' as visitors walk by," said Millard, "and it draws in a variety of people, from teenagers to adults, who became visually engaged with the hospital's story and history of serving the Kansas City community." The use of multi-touch media walls is still very much a niche market, with most interactive wall projects established by "early adopters.' If interactive media walls emerge as the "next great thing," expect to see more of them in common public spaces such as airport terminals, malls, museums and any place that represents a 'social watering hole.' Used properly a media wall could be as much of a game changer in popular public communications as tablets have been as an upcoming alternative to laptop usage.